Shawna Carter is an Alternative Kid Lit author and illustrator from Belleville, Ontario. The 29 years old enjoy spending time with her wife and daughter. Shawna have self published 2 books successfully and her third and fourth work has been picked up by NCM Publishing for traditional publishing so you will see more of her book in stores and all over instead of just being available online. 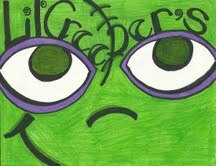 Her website, www.lilcreepers.ca was launched in March by Ton Up web design out of Picton Ontario and is currently working on the marketing aspect of her work. Lil' Creepers book series is getting bigger by the year! With already two books out, and three more on the way! First was Lil' Creepers and then came Cooking with Creepers and in July we will see Lil' Creeper's Winter Shenanigans and you'll have to wait to see what comes out this halloween! 3375 Tell us about your latest book? 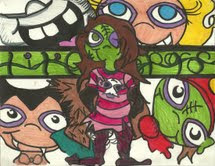 SHAWNA My latest book is titled Lil' Creeper's Winter Shenanigans and it is a full length story book,fully illustrated by hand and touches on bullying. It's got mystery, humour and a touch of home in it and I think everyone can relate to it. 3375 How did you get started as a writer? SHAWNA I've always been writing and drawing lol as long as I can remember. The books started coming though after I had spent several weeks in the hospital. I had always thought about doing it, I just needed the time and the drive and with the help of nurses, I found what I needed to start. They always say, write about what you know - so I wrote my first book based on my daughter and her kitten. 3375 What does a typical day look like for you? SHAWNA Typically? I wake up and need a cup of tea lol I watch Live with Kelly with my wife and then I start answering emails. Once I get started I update my socia media outlets, and then get down to paperwork. Nobody tells you how much paperwork is involved with being an author! I try to work drawing into everyday, even if it's not for a book. I like to keep that part of my brain awake. SHAWNA My workspace is my kitchen. Sometimes it looks and serves as a kitchen but when I'm working there are notepads everywhere, there's pencils and paint and stuff everywhere, always music playing - I can't work without music - and there are books EVERYWHERE. And Art, some of mine and some of other people's. There is a huge pencil drawn picture someone did of Harry potter, it's one of my fav's. SHAWNA My favourite book for inspiration is Anne of Green Gables. The language in it is incredible and many of the words aren't used anymore -empurpled - so I like to use them lol I also love Scarlett, for the time period and lastly I'd name Wicked, because it's preposterous. 3375 Tell us 3 interesting/crazy things about you? SHAWNA I have over 20 tattoos, that's interesting for a children's author lol My wife and I were married at a chapel in Niagra Falls Canada almost 4 years ago and.... My favourite movie is Gone with the Wind. Not very crazy things but I like to keep life interesting! 3375 What your favorite quote? SHAWNA Today you are you, that is truer than true. No one will ever be more youer than you. - Dr Suess. 3375 Best and worst part of being a writer? SHAWNA The best part of being a writer is allowing your imagination to take over. You are always told not to let it run away with you, and then suddenly you can let it go! The worst part is the paperwork, business plans, marketing plans, contracts ...there's just so much of it! SHAWNA Don't expext results overnight. FOR ANYTHING. lol Keep plugging at it and do everything you can to get noticed! 3375 Tell us a story about your writing experience? 3375 When can we expect the next release for lil creepers?